(Herbal Tea Types To Improve Your Immunity) Seasons keep changing and the constant change in the climate can make you fall sick. What can be better than sipping a sip of herbal tea while sitting on your balcony and watching the sunset! With ingredients easily available in the kitchen, these herbal beverages will keep your sickness at bay and boost your immunity. Here are the various Herbal Tea Types that can improve your immunity system! Ginger tea is one of the most common out of all the herbal tea types. Ginger is the remedy ingredient for cold-related problems since time immemorial. It is not only good for your stomach but also for blood circulation and respiratory tract. Ginger serves to be a solution for most allergies. Preparing Ginger tea is no man moth task. All you need to do is add some ginger root to boiling water and cover it for a while. Later, few drops of lemon can be added to finish your tea. Various herbal tea types also include the honey and rose tea. Rich in Vitamin C, it promises to cure a sore throat and diarrhea which are common diseases these days. Honey and rose are ingredients that can cure any kind of immunity-related problem. Add few rose petals to boiling water. Allow the rose petals to infuse and merge in the water till it turns into a darker shade. Add Honey and mix it well. You are ready to Go! The ingredient has many uses that can really boost up your immunity system. Peppermint not also is refreshing but also helps in digestion. It is used as a mouth freshener. It possesses menthol that helps to bring down fever. Peppermint eliminates inflammation, cures bad breath and reduces pain. The Tea takes hardly few minutes for preparation. Crush 6 to 7 peppermint leaves and put them in a cup. Pour Hot water into it. One must remember that the water shouldn’t be boiling hot. Let the water stay for 10 to 12 minutes. Filter the leaves and the Peppermint Tea is ready! 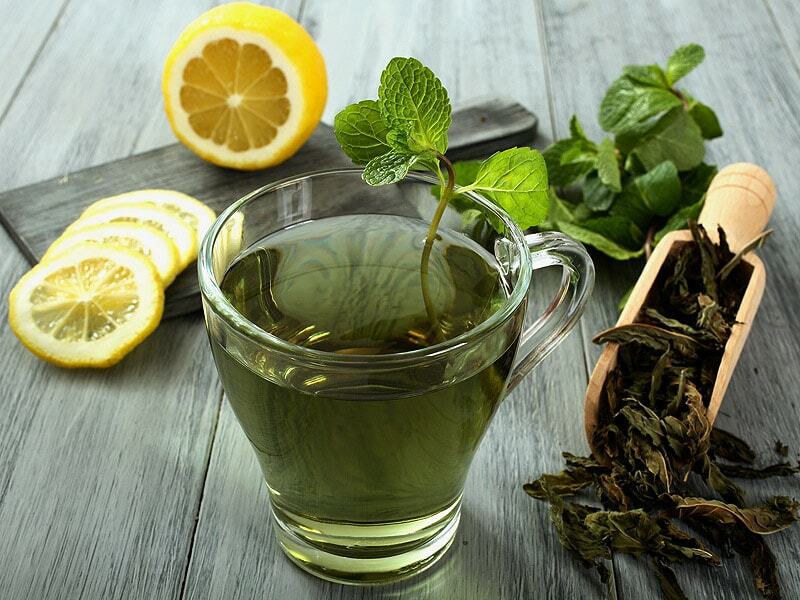 Containing a lot of antioxidants, Green Tea helps the body exponentially to fight diseases. It aids in flushing out harmful toxins and purifying the body. Green Tea is the easiest and the best out of all the herbal tea types to keep you healthy all the year round! To prepare Green Tea, add few tea leaves in a strainer. Place a cup under the strainer and add boiling water. Your ideal Green Tea is ready! Chamomile ingredient is a rare ingredient and the majority of us are unaware of it. It has properties that serve as a remedy for all stress related problems. Chamomile helps in beating stress and insomnia. It helps you relax and avoid stress fevers. It also enhances the digestive system and fights the common cold. Chamomile tea can be brewed with dried Chamomile Flowers. Although, it is preferable to use chamomile tea bags that are easily available in the market. Infuse the tea bag into the cup of boiling water. Let it stay for five minutes or so and your Chamomile Tea is ready for consumption! Honey or sugar can be added in small quantities to the tea for better taste. Though it is recommended that these herbal tea types should be prepared as it is, without adding any extra ingredients. Considering the above list, now you know the recipe for good health and good immunity system!